PRETIRE is an elite recruitment platform that connects experienced senior executives to exclusive assignments. Currently operating in South Africa. ‘Pretirement’ is a rising, global trend that is being fuelled by longer lifespans, shortages of skills and a demand for contract-type, flexible work. This gradual transition into complete retirement presents an opportunity for pretirees to offer their experience and skills on an ad-hoc basis, rather than sinking into full-time retirement. PRETIRE brings the experience back to the workplace. PRETIRE candidates are semi-retired, highly-accomplished experts with senior management experience and proven track records. Each pretiree is carefully vetted before being listed on the platform. PRETIRE clients are organisations that seek Senior Executives to fill temporary roles or complete projects demanding world-class expertise and experience. Typical roles include Acting or Interim Positions that need to be filled until a permanent appointment is made, and projects such as Due Diligence endeavours, Marketing, Restructuring and Strategic Assessments, to name a few. Pretire clients range from large corporates, small to medium businesses and state-owned enterprises, to private equity groups and fund managers. Download the PRETIRE app from the Apple or Android stores. PRETIRE is an app-based platform that connects high-calibre candidates to exclusive assignments at respected organisations. Use the PRETIRE app or website to browse the directory of vetted and approved pretirees. Our highly-experienced candidates include former CEOs and CFOs of major listed groups, Tax Specialists, HR Directors, Marketing Directors, Production & Technical Directors, and more. Clients who successfully contract a PRETIRE candidate are charged competitive commission fees that are below recruitment agency rates. 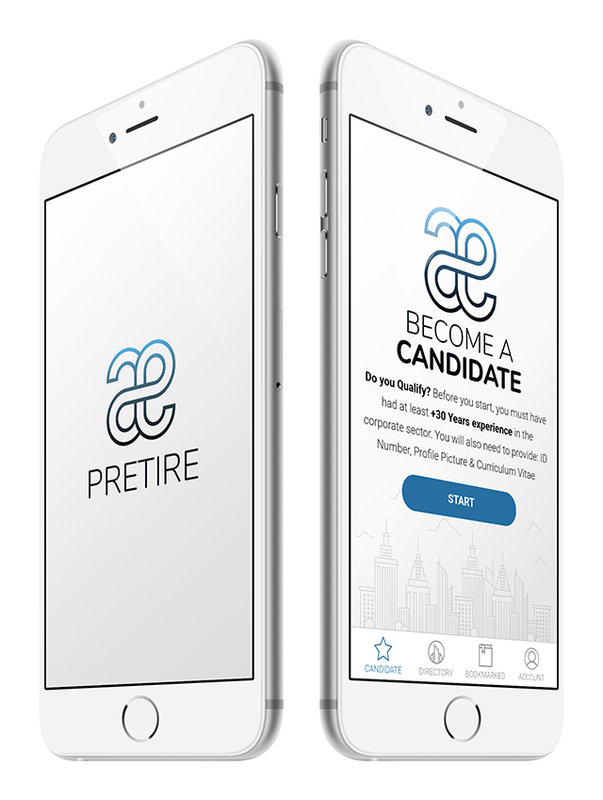 PRETIRE-approved candidates will be listed on the app, free of charge. Looking for experience? Use the app or website to bookmark suitable candidates before making contact. Note that first-contact messages sent via the platform are reviewed by the PRETIRE team. Thereafter, candidates deal directly with the company to arrange the nature, duration and terms of their contract. Contractual obligations and terms are defined between the client and the candidate. Once the project scope and duration have been agreed upon, PRETIRE will handle the end-to-end billing process. PRETIRE is serviced by a hands-on team who personally screen and approve each candidate. Only the most accomplished and experienced candidates are considered, thereby streamlining the recruitment selection process. Our personal service is designed to minimise admin and make the contractual recruitment process a pleasant one. By filtering the messages to candidates, we ensure that our pretirees only receive relevant and appropriate opportunities. Create a PRETIRE account today to get full access to the candidate directory and private profiles. ARE YOU AN ACCOMPLISHED PRETIREE? PRETIRE is not just another recruitment platform. We only list candidates who have senior management experience, a proven track record & who have gone through our vetting process. As a PRETIRE candidate, you can be assured that we will filter contact requests and only connect you with opportunities that suit your profile. Download the app, click “APPLY” below. Create an account and submit your application, including your ID / Passport number, CV and profile photo. Your application will be reviewed within 2 -3 working days. During this time, we may contact you for additional information. Once approved, you will be listed on our candidate directory. Once your profile has been activated, it will appear on the PRETIRE directory. We will notify you when a suitable company would like to contract your experience and expertise. Looking for support? Send us an issue report or submit any technical questions regarding the platform. Click here to request support.